At US Youth Soccer we provide a fun, safe and healthy game for ALL KIDS...big kids, little kids, tall kids, short kids, young kids, older kids...kids who want to play for one season, kids who want to play for 20 seasons, kids who play strictly for fun, and kids who want to compete at the highest level possible. This week we want to break from the competition and make sure we’re all just having fun! Make sure you take time this week to enjoy the moment and remember the fun soccer brings into your life by kicking a soccer ball everywhere you go, watching your favorite team play, pretend to be your favorite player or even get mom and dad to take you to a game. We want to make sure each and every player, past and present, remembers the fun soccer has brought into their lives. Make sure you celebrate Street Soccer Day this week on Sept. 6! Street Soccer Day is all about grabbing a group of friends and playing pick-up soccer games. Learn more here. 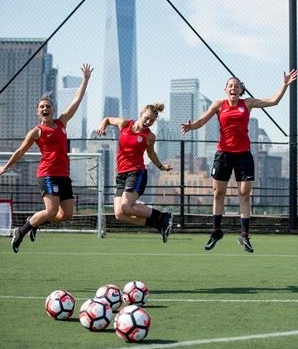 As Fairfield University teammates, Alanna Locast, Shannon Fay and Carly Beyar were joking about the struggles of being a female soccer player, which led to creating the Twitter handle, @SoccerGrlProbs in 2011. In 2012, the girls created their first YouTube video, which immediately went viral. With the success on Twitter and several YouTube videos, SoccerGrlProbs has turned into a lifestyle brand, selling several items from their online store while also empowering young women to feel comfortable in their own skin. Their mission is to support and encourage the well-being and positive self-image of young female athletes everywhere. Through building their name, SoccerGrlProbs have been able to display their love for the game and the fun that the sport has to offer. What are some of your most fun memories of playing soccer when growing up? Carly: My most fun memories of playing soccer were bonding with my teammates on away trips! Team dinners, hotel nights, long car rides, getting to travel all up and down the east coast and across the US was so exciting! Alanna: The overnight hotel trips with the whole team were always the most fun! You got do everything together, meals together, car rides together, laughing and running from room to room in the hotels. It was the memories with those teammates and the bonds we made that made soccer that much more special. Shannon: I always loved team pasta parties and movie nights. You end up having 20 best friends who you get to play soccer with, travel with, win and lose with which is pretty special. I still talk to so many of my old teammates and love bringing up memories from our years of playing together. What is it about soccer that makes it such an enjoyable game for all different types of people? Carly: I love that soccer can bring so many people together, including strangers. It doesn't matter if you are "different" -when you are playing, you are on a TEAM and as long as there is a common goal, everyone can come together and enjoy the game that they all love. Alanna: We always say it's amazing how soccer can bring people together. When we are traveling, we love to host free pick up games for people to come and play with us. It is amazing how many people will come out from all different kinds of backgrounds. All different ethnicities, parents, players, siblings, young kids and adults. Everyone comes together when there is a ball at their feet. Shannon: Everyone has their strengths and weaknesses as a player but together a team can use everyone's strengths to their advantages it's pretty special. I think that on the field everyone has a common goal and it connects people who otherwise might not get to know each other. How did SoccerGrlProbs begin? What was the motivation? SoccerGrlProbs began in 2011 during preseason when we were all playing for the Fairfield University Women's Soccer team. We began joking around about the struggles of being a female soccer player and before we knew it, we spontaneously decided to create the twitter handle, @SoccerGrlProbs. We used this comedic outlet as a way of sharing inner thoughts and funny moments about the everyday life of a female athlete. The word about our Twitter account spread like wildfire within the soccer community and before we knew it, we were asked to create a YouTube video. In 2012, we created our first YouTube video "Sh*t Soccer Girls Say" which blew up and hit 1 million hits in less than 3 days. We were in absolute shock! What initally started as a comedic venting outlet, became a lifestyle brand with the release of our first t-shirt! We sold out of 300 t-shirts in less than 24 hours. This is when we knew that we had such a huge impact on the female soccer community. Our motivation is being able to empower these young women to feel comfortable in their own skin and to absolutely LOVE their unique and athletic self. Is it exciting to be able to have a business that focuses on the game? YES! We are SO blessed to be able to still be involved with soccer, especially on a much deeper level since we've graduated. We love that we can still attend soccer tournaments (especially one's that we used to play at!) and meet fans from all over the world. We all share a common interest for the most beautiful game in the world. It is so empowering to be able to give back to soccer what soccer has given us throughout our years of playing. It's shaped us to be the people we are today and the ability to work as a team with our business! We learned so many valuable lessons throughout our soccer career, and to be able to pass those lessons along to help younger girls be confident and proud, is the most incredible thing for us. After six years, what keeps you going and makes running SoccerGrlProbs fun? Carly: It's been 6 years and I still get excited to come to work everday. In fact, we always joke about how we are working 24/7 because we are so involved with engaging our fans and putting out hilarious content! SGP is our heart and soul and it motivates us every single day to be better role models and to empower one another. I would have to say there is never a dull moment working with Alanna and Shannon....followed by "pee your pants" laughter. It is such a fun environment to be in every day. Alanna: What keeps us going is getting to meet our young followers or read emails from them or their parents. We'll get a kid that comes up to us and tell us, "I watched every one of your videos when I tore my ACl and it helped me make it through the hard time of having to sit out and rehab" or a parent that emails us and tell us that their 12 year old daughter is walking around the house proud of her leg muscles. It's little things like that, that remind us of the power of positivity influencing someone through simply being our genuine selves. Seeing someone who is maybe a little more confident or proud to be different because of something we've done or said, makes me happy to wake up every morning. Shannon: Our loyal followers keep us going and the never-ending content, questions and comments they send our way. We never run out of ideas because there will always be more "soccergrlprobs". Meeting our fans, traveling to places and talking to people we might not have if not for sgp is what keeps us wanting to keep doing this. We have fun at work and get to do what we love for a living- how could we not want to continue this!? What tips do you have for kids to enjoy the game and get the most out of it? Carly: My tip would be to remember that this is supposed to be FUN! Don't get down on yourself when you lose the ball or don't get upset when you think you didn't play well - every new opportunity is a chance for you to work harder and have fun with your teammates! Cherish every moment! Alanna: My tip would be to not beat yourself up over the little things! It's so easy to get zoned in on the negatives...a goal you missed, or a pass you messed up, or a teammate you maybe don't get along so well with. Instead it makes things SO much more enjoyable if let the good things and the positives take over. Keeping a positive mindset will change your experience! Shannon: Don't stress. When I was younger I put so much pressure on my self and often would be so nervous about making a mistake I wouldn't get to enjoy myself and have fun. Remember why you are playing this sport-it's to have fun and enjoy yourself! !